Cole's Painting LLC is the most trusted and dependable name in painting within the Puyallup area, with a proven history of excellence and customer satisfaction. Cole's, the painters to call when you require superior service - Guaranteed! Family owned: We do the work so we have precise control on the quality and there is no management that needs to be paid resulting in a superior paint job at a better price for you. At Cole’s Painting Is Our Profession. Call for a free estimate. Our specialist will measure and evaluate the condition of the area to be painted then provide you with a detailed estimate that contains no hidden fees. 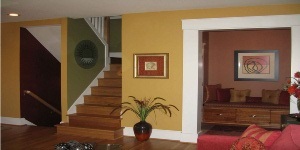 We will also work with you selecting paint products and color combinations if needed. Cole’s Painting is located in Puyallup Washington. Owned and operated by the Cole family we have been providing painting and construction services to the Puget Sound area for over 15 years. We provide a full line of painting services specializing in exterior and interior house and commercial painting. We also provide drywall repair, millwork, door and cabinet refinishing. The Cole family of Puyallup has been in the painting and construction business for over 15 years. Our whole family is involved so you can be assured that when the painters arrive it is one of Coles doing the painting not some college student on a summer job or a temp agency employee making some extra cash. From estimates to painting it is the Cole family that will be there doing the work. New paint will give your home’s interior or exterior a new and exciting feel. We provide durable, cost effective and attractive solutions to your painting needs. When we arrive we begin with our meticulous preparation: Moving all furniture away from your walls and covering your belongings with a thick plastic tarp to prevent accidental drip damage, we then fill any holes and gouges in walls or repair mold and rot damage, seams are then caulked and primer applied as needed. After the site is prepared we then carefully paint your house with the same attention to detail we used in preparation. 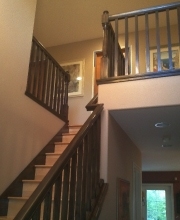 After the paint is applied we clean up and leave your house in pristine condition. The only way you will know that Cole’s has been there is the beautifully applied paint to your home’s interior or exterior.